The U.S. delegation takes a group photo during their Australia visit. 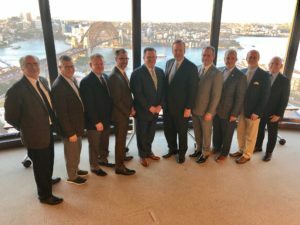 Maine Credit Union League President/CEO Todd Mason is in Australia participating in a World Council of Credit Unions’ trip to study how financial cooperatives there are growing in an exceedingly competitive and digital environment. Mason joins a delegation that includes Brian Branch, President & CEO of the World Council of Credit Unions; Jim Nussle, President & CEO of the Credit Union National Association; Scott Simpson, CEO of the Utah Credit Union League; and executives from credit unions and leagues in California, Indiana, Florida, Oregon, South Carolina, and Washington. During their stay, the delegation will examine several key issues facing credit unions globally including taxation, growth, digital innovation, branding, and regulation. Field visits to cooperative branches in Melbourne and Sydney are planned. The trip concludes on April 16.